If you spend time in the sea, you know how cold it can be afterwards. The exhilaration of the water has worn off and as the wind and rain howls around you all you want to do is get back into warm clothes as quickly as possible. The dryrobe ® is the warmest, most advanced change robe in the world. You can get changed inside it – allowing you to whip off that wet swimsuit or wetsuit as fast as you can. Then keep it on over your clothes while you warm up with a hot drink and think about how great you are for braving the elements. Cold-weather conditions present unique challenges. Preserve your energy and core temperature with full-body protection from the elements. Leave it on over your clothing or wetsuit and re-use multiple times throughout the day without the dryrobe ever feeling wet or cold. Take a look at these divers – they realised when they were in Ireland that they needed a dryrobe! Brrrr…..
#mydryrobe Cliff Diving with Blake Aldridge from dryrobe on Vimeo. At The Sports Room, we can arrange for your dryrobe to be personalised with your name, club name or whatever takes your fancy. We can match the stitching to your dryrobe colour or choose any colour you like. Personalisation just takes a couple of days from order date. We stock both the dryrobe Advance Short Sleeve and the dryrobe Advance Long Sleeve. Other products are available to order. What’s so great about a dryrobe? The dryrobe has a waterproof & windproof exterior fabric and a lining that dries you and keeps you warm. The design allows plenty of room to pull your arms in through the sleeves to get changed inside it. You can get a wetsuit, swim or tri kit, on or off, easily, while staying warm, dry and fully protected from the elements. Other features include, soft lined external pockets, large internal storage pocket & MP3 player pocket. The unique chunky YKK® Zip front is an essential element providing fast, easy exit & entry. 100% waterproof and windproof outer shell fabric. One piece body construction with no shoulder seams. 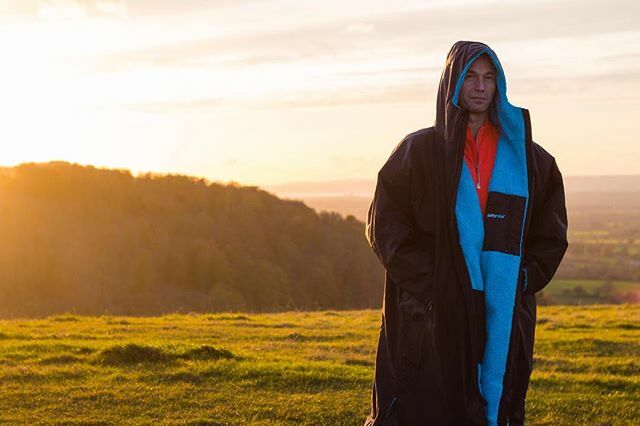 Super warm lining – The lining is a synthetic lambswool (51% acrylic, 49% polyester) which draws the water away from your skin, drying you instantly while insulating you and making you feel unbelievably warm. When conventional towelling gets wet it takes an age to dry and feels wet against your skin, throw in some wind chill and you’ll know all about it. Sealed seams. All the seams on the dryrobe advance are sealed. This, along with the minimal seam design ensure the best protection possible from the elements. External fleece lined pockets – keep your hands warm & store your essentials with super safe, chunky YKK® Zips. A huge 20 x 26cm internal ‘soft lined pocket for storing underwear, clothing or thermal base layers. The inside chest pocket can safely store your valuable items sealed in the ‘2 way waterproof’ design. Your valuables cannot get wet from the outside or from the inside (if you are wet or in a wetsuit). What’s the right size for you? 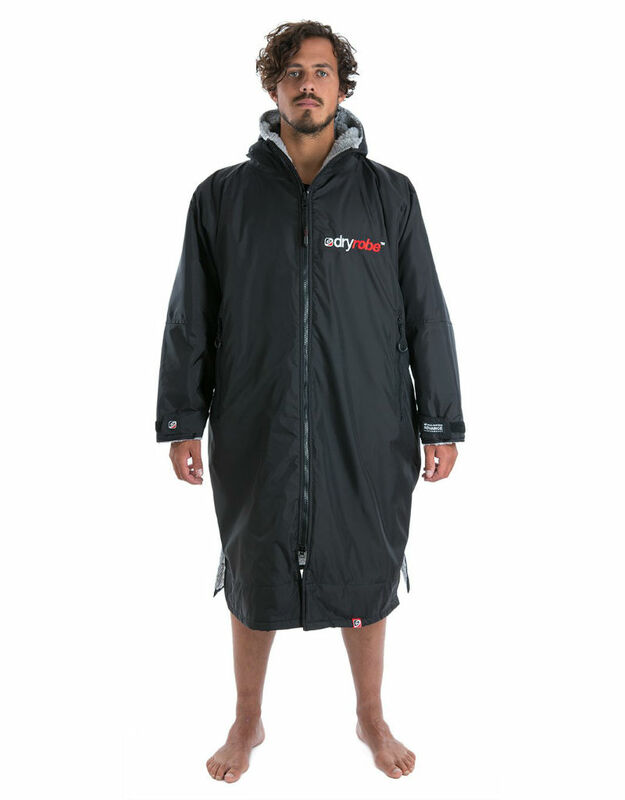 dryrobe® The Outdoor change robe™, was designed by Gideon bright, a North Devon UK based surfer with over 30 years experience in the water. 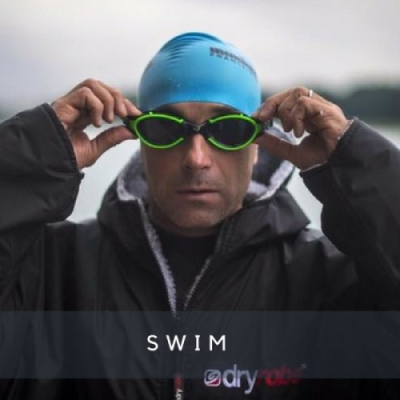 Dryrobes can be used for swimming, surfing, triathlons, diving, rowing, ocr or any outdoor pursuit. Many a parent browsing The Sports Room has wished they had them for standing on the sidelines of their kids’ rugby, hockey or soccer match! The Sports Room is a swim, bike and run specialist and independent shop based in Wicklow Town. Swim brands we stock include Funky Trunks, Funkita, Huub, Aquasphere, TYR, DryRobes and Speedo . We also stock a range of swim fins and swim training accessories.